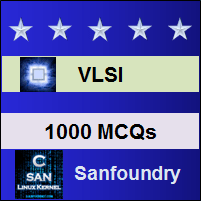 This set of VLSI Multiple Choice Questions & Answers (MCQs) focuses on “MOS Circuit Scaling – 2”. Explanation: The dynamic component is the product of energy per gate and maximum operating frequency. Explanation: Switching energy has the same scaling factor as that of power speed product. Explanation: Channel resistance is scaled by 1. Therefore there are no factors like α or β.